The tips of the fruiting bodies are flattened and branched, giving them a "cockscomb" appearance. 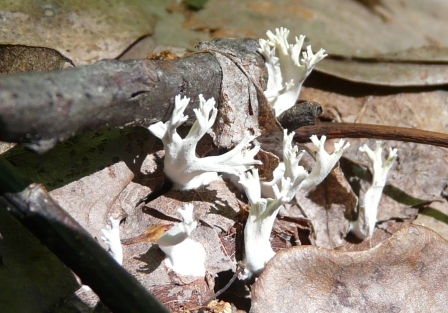 Species: Clavulina cristata. These were growing on leaf litter just off the Caldwell Rim trail in Sewanee. They are only a couple of centimeters high. This entry was posted in Fungi on June 30, 2011 by David George Haskell.